It is important to choose a quality air-conditioner unit that is reliable and able to last in the harsh weather. Other than that, choosing an energy efficient air-conditioning system is also essential in building a sustainable environment and also saving energy bills in the long run. Hence, this is one or the few reasons why many households and business owners in Singapore have chosen to install Toshiba aircon Singapore. At Wei Wei Aircon, we are capable of servicing and repair different brands and types of air-conditioning system, including Toshiba aircon servicing. Hence, if you are looking for quality aircon servicing or repair for your Toshiba aircon in Singapore, feel free to contact us anytime. With the years of experience in the air-conditioning industry in Singapore, we are well equipped with the technical knowledge, skills and tools to service, repair or replace your Toshiba air-conditioning system. Our well-trained technicians are able to perform qualified and quality Toshiba aircon servicing in Singapore. During the servicing, our technicians will perform thorough checks on your air-conditioner system. If there are any potential issues found in your air-conditioner system, our technicians will raise out the issues and advise on the possible solutions to rectify and fix it. It is crucial in identifying potential aircon issues in your Toshiba air-conditioner system because if these problems are not being fixed in time, it could worsen the problems and result in a hefty repair cost. Thus, if you require Toshiba aircon servicing, feel free to contact us to book a servicing appointment today. Toshiba is well known for its wide range of household electrical products such as Television and many more, not forgetting Toshiba air-conditioner where they are quite popular among households in Singapore. At Wei Wei Aircon, we specialise in Toshiba aircon repair and servicing for different types of aircon system in Singapore such as a split system aircon, ceiling cassette aircon and many more. Being one of the leading aircon servicing company in Singapore, we are equipped with the appropriate tools and knowledge in repairing your air-conditioner system. Hence, regardless of the type of aircon system, old or new, our qualified technicians will be able to fix your units efficiently. During the lifespan of your air-conditioning system, you may face problems such as aircon not working, aircon not cold or aircon switch on and off automatically. The above are just some of the common problems faced by local households, there are more air-conditioner problems that may arise over the years of operation of your system. However, you do not have to worry when you face these aircon problems. By engaging us, our experts will be able to assess the condition of your air-conditioning system and diagnose the cause of the problems. Our technicians will advise our customers on the solutions to repair your Toshiba air-conditioner and regain its functionality. In order to prevent aircon problems from occurring in your units, it is important to ensure regular Toshiba aircon servicing and maintenance is being done. Regular servicing can ensure that your units is being cleaned thoroughly and able to improve the condition and performance your system. At Wei Wei Aircon, we are experienced in servicing and repairing different types of Toshiba air-conditioner in Singapore and are able to regain the cooling functionality of your air-conditioning system. Other than providing aircon servicing and repair, we also provide aircon chemical wash for your Toshiba aircon in Singapore. Aircon chemical wash is one of effective cleaning services where it is able to thoroughly clean and wash out all the dirt, dust, bacteria and even mold that have accumulated in the air-conditioning system. Dirt and dust will start to accumulate over time during the operation of the units. The condition of your units worsens when you do not service and maintain your units which promote the growth of dirt, debris, mold and even bacteria. Hence, by having a Toshiba aircon chemical cleaning for your units, you are able to remove all these harmful substances. Other than keeping your air-conditioning system clean, it has many other benefits such as clean and healthy air, improve operating efficiency, performance and cooling efficiency. Most importantly, it can reduce the possibility of system breakdown and extend the lifespan of your equipment. Our qualified technicians are capable of performing aircon chemical washing for different types and brands of air-conditioner including the Toshiba air-conditioner. Hence, if you are looking for a chemical wash for your units in your home or office, feel free to contact us. Regular aircon maintenance for your Toshiba air-conditioner system is essential in up keeping the condition of the units. In some cases, if your air-conditioning units have not been serviced for a period of time, it can result in certain problems from arising. Hence, if you encountered any aircon issues, it could be due to the lack of regular servicing and maintenance. Hence, always ensure that your Toshiba air-conditioning system is regularly serviced during the lifespan of your system to ensure that it is always in good working condition. Regular Toshiba aircon maintenance and servicing can ensure that your units are in top notch condition and extend the lifespan of your air-conditioner system, making it a worthwhile asset to keep your house cool. During our regular maintenance, we have the appropriate tools and equipment in performing servicing and checks on your air-conditioning system. Therefore, we are able to perform quality servicing and advise you on any issues detected, if any, during our regular checks on your system. Toshiba have long been in the household appliance industry for a few decades, providing reliable and quality appliance to the households in Singapore. 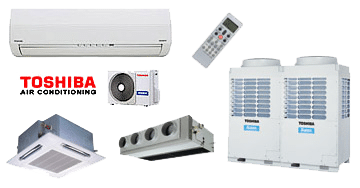 Toshiba aircon has been in the air-conditioning industry in Singapore for many years and it has been one of the popular choice among locals due to its quality and reliability. With our certified aircon installer, we are able to provide Toshiba aircon installation services to residential, commercial and industrial premises in Singapore. It is important to engage a professional installer to install your air-conditioning system. It requires expertise, experience and appropriate tools to professionally install the Toshiba system and prevent potential problems such as water leaking, aircon not working and leakage problems from arising due to poor installation. There are cases where the condition of your air-conditioning system is too old or it is beyond repair, in this case, you may need Toshiba aircon replacement services. We are able to replace Toshiba aircon with our quality and professional aircon installer. Thus, if you are looking for professional aircon installation or replacement services in Singapore, feel free to contact us for more information. Toshiba has been manufacturing and providing quality products in Singapore and across the world. One of their well-known products is their Toshiba air-conditioner where the company has integrated innovative technology and constantly developing their air-conditioner system. This makes their air-conditioner being more energy efficient while ensuring the cooling performance and quality is not being compromised. The improved efficiency helps in reducing the power consumption of the equipment and able to promote the building of a sustainable environment in Singapore. Hence, this is one of the reasons why many households have chosen to install Toshiba air-conditioners. During the lifespan of your units, there will be chances that your air-conditioning system will be facing issues. You do not have to worry as our technicians are well-trained in Toshiba air-conditioners and are able to perform servicing and repair. Hence, if you ever need aircon servicing or repair for your Toshiba air-conditioners, you can engage us for our wide range of aircon services. It is crucial to engage professionals for regular aircon servicing and maintenance to ensure that your units are in top notch condition. With years of experience in the air-conditioning industry, we have the knowledge and experience in servicing, repairing, chemical washing, installation and even a replacement for your Toshiba aircon. You can safely allow our experienced technicians to handle your units and perform necessary aircon services. It is unavoidable that your units will face problems during operations. However, do not fret as with our qualified and experienced technicians, we have repaired different types of the Toshiba system in different households and offices. Thus, we believe that we are able to fix the aircon issues that you are facing and meet all your air-conditioning needs. Call us today to find out more about our aircon services.